Isn’t it great to get fantastic reviews! You work so hard looking after your customers, naturally they give you fabulous feedback that influences potential future guests. To find your reviews in freetobook simply go to your “Home” TAB and select “Reviews”. Share your great reviews with the world. Freetobook is about to release a new review sharing system so you can get your reviews out there and read by potential guests. freetobook’s new “click here to share” a review instantly on facebook and twitter. linked to your booking system for instant direct bookings. It gets better…each review widget will give guests instant access to your freetobook reviews and link them directly to your booking system, making it easy for impressed customers to make a direct commission free booking there and then. Keep an eye open for the launch of the new review sharing system… another great idea from freetobook giving you more for less. As soon as the review sharing system is available you will find it in the same place as your current reviews – go to your “Home” TAB and select “Reviews”. We expect to launch the new review sharing system before Christmas 2013 so it won’t be long before you can show off all your best reviews across your website and social media platforms. In the spirit of sharing please feel free to tell others about your experience of freetobook the internet booking engine with more for less. Fast, free and easy way to get more TripAdvisor reviews. With freetobook you always get a competitive advantage from our cutting edge technology that keeps you in control and fully armed with a variety of tools and services, all created to maximise your bookings, marketing and reputation. Using this new function freetobook gives you the option of connecting TripAdvisor’s automated review request system to your customer’s email address and checkout date. If you opt into this service (in your TripAdvisor account) then TripAdvisor will be given all of your customer’s email addresses along with their checkout dates (future bookings). If you authorise TripAdvisor they will then send out automated review requests after your customer has checked out. This service is available free of charge to all freetobook customers. It is available to all accommodation properties except those listed as Vacation Rentals by TripAdvisor. How do I switch on Review Express automatic emails ? 1. 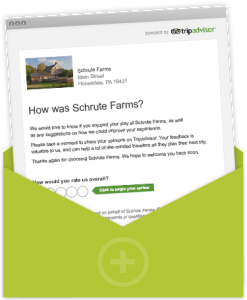 Simply login to your TripAdvisor account on TripAdvisor’s website, click on the “Review Express” logo and select the “Send Emails Automatically” TAB (there is no need to contact freetobook). 2. Agree the Review Express conditions and confirm that freetobook is your internet booking engine. That’s it! This is a do it yourself service and there is no need to contact freetobook. How does Review Express work ? Freetobook makes no charge for this service and TripAdvisor do not charge. It is a do it yourself service, simply opt in by logging into TripAdvisor, no need to contact freetobook. What freetobook does when you sign up to Review Express. Within 24hours of signing up to Review Express the freetobook system will automatically send TripAdvisor the guest email addresses and checkout date for all your future bookings. If a booking is later modified we send TripAdvisor the new data. If a booking is cancelled we let TripAdvisor know not to send an automated review. TripAdvisor have let us know that if a property later opts out of Review Express they will not send any automated reviews using the data you have given them access to. You opt out from your TripAdvisor account and freetobook will know within 24hours. Freetobook provides the Review Express service automatically there is no need to contact us as the service is activated using your TripAdvisor account. Like many services offered by freetobook it is free and optional. Freetobook also offer some premium paid for services like Channel Management and Mobile Website and Booking – find out more. Here at freetobook we keep an eye on industry trends and an even closer watch on trends within our own booking systems.. with thousands of accommodation owners using freetobook we have an insight into trends and that can help you improve your direct bookings. Freetobook is a highly advanced mobile friendly internet booking system which enables all our customers to maximise their mobile bookings. 3. In the last three months 61% of email opens in the USA were on a mobile or tablet. Most research is now showing that customers are using multiple devices to book and research travel its fair to say the touch points with customers are diverse in time, browser and device. Freetobook has the flexibility and advanced functionality across mobile platforms so your customers can book on any device, this means you won’t lose bookings as the world of mobile changes and customers habits morph, freetobook moves ahead. 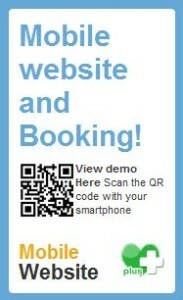 Watch the freetobook video below and see what mobile booking can look like for your customers. Great Technology doesn’t just happen ! Its also rather difficult to describe but when you see it, when you use it, you just know its good. At freetobook we take considerable pride in our work and our booking system solutions are renowned for their time saving functionality and their ease of use. Along the way we work with many technology companies and there is none more switched on to the internet and the way online booking should work than Booking.com. This is why they sell more than 500,000 room nights every 24 hours and work with over 368,000 properties in 190 countries. From our experience most of the worlds accommodation owners are looking for ways to get more connected and enjoy more distribution, at freetobook we get this message and so does booking.com. I recently wrote an article on tnooz the travel technology news magazine. 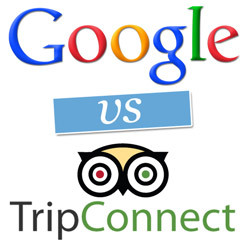 (link here) All about how TripConnect is far better than Google PayPerClick for independent hotels and Bed and Breakfasts. A reader replied to tnooz suggesting the article was ALL wrong ! Claiming I had confused Google CPC (CostPerClick) program with Hotel Finder bidding program and that Google was the first Metasearch engine to connect to hotel’s CRS. He makes a fair point in that there are two systems but I have certainly not confused them. The article is about independent hotels and guest houses and Google Hotel Finder is only available to OTAs and hotel chains. Google have not connected to the properties directly so independent individual properties cannot use their Hotel Finder. The equivalent product on Google is therefore straight CPC campaign. There is therefore no confusion, TripConnect advertising has to be compared to Google standard CPC for independent properties because Hotel Finder is not available to these properties. (in some senses that is the point of the article) TripConnect connects hundreds of thousands of independent properties with plans to connect millions. These properties currently have no way of participating in Hotel Finder. Why is Google ignoring this market ? The complainer ends the complaint suggesting that Google post a response. I for one would certainly welcome a response from them, I think there are some major advantages to the Hotel Finder system if only they would connect more broadly. Google are missing an enormous opportunity to earn click revenue and I welcome a reply as would millions of property owners that would be delighted to hear a response from Google Hotel Finder. As of today independent hotels, bed and breakfasts from all corners of the world can advertise directly for bookings on TripAdvisor. Owners will be able to drive direct bookings with zero commission from their TripAdvisor pages. They will be able to bid for clicks on a PayPerClick basis. 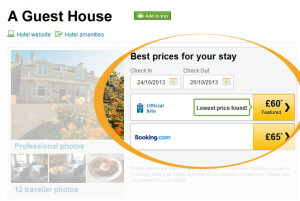 This is nothing short of a revolution in the way TripAdvisor promotes accommodation, a new way to get direct bookings. If you are a property owner you can use the TripConnect system to show real-time rates and availability with a booking button for the customer to complete the booking. What will you need for TripConnect to work ? 1. An approved Internet Booking Engine (IBE) like freetobook. When you have all three of the above you can set your PayPerClick budget and get started. You will be able to set a daily cap on your spend and you can do it for as long as you want. TripAdvisor will give you a forecast for monthly spend so you get an idea of costs. As each booking comes in freetobook will show you that it came from TripConnect. You will also get a report from TripConnect showing your click costs and the booking revenue you achieved. This way you will be able to analyse the return on your advertising spend. Freetobook is a Premium partner of TripConnect and can offer the service worldwide. If you already have a freetobook account you just need to contact TripConnect to setup your account. If you don’t yet work with freetobook this is an ideal time to signup. Posted in 2013, marketing, online, reviews, sales, technology, TripAdvisor, TripConnectTagged TripAdvisor, TripConnect, TripConnect PayPerClick, TripConnect premium partner, tripconnect world-wide, What is TripConnect ?4 Comments on What is TripConnect ? Google will lose PayPerClick advertising revenue to TripConnect. Here at freetobook we are predicting Google will lose advertising revenue from property owners. We are already getting a significant number of property owners telling us they plan to switch their Pay Per Click budgets onto TripConnect. It makes total sense to us when you look at the logic, if your money is limited it is probably better spent on TripAdvisor’s new TripConnect system. Why is Google Pay Per Click inferior to TripConnect ? 1.Google Pay Per Click is wasteful : TripConnect will not show adverts when the property is unavailable. The TripConnect system checks availability and rates with the properties Internet Booking Engine (IBE) before showing the advert. By comparison Google Pay Per Click adverts are not “availability dependent” and will always show, costing clicks when a property is unavailable. 2.Direct into the booking process: TripConnect puts the customer directly into the booking process cutting out wasted time spent browsing, you have all the information to make the purchase…. price, price comparison, availability and a quality ranking. A Google advert provides none of these. 3.Customer purchase point: When a potential customer is searching on TripAdvisor they are beyond the simple Google search “London Hotels” they are looking for “Which London hotel” where would you rather put your money ? 4.Easy ROI Tracking: TripConnect has built in tracking to show bookings completed alongside the costs so properties can easily tack their Return On Investment (ROI). Yes, Google has their analytics but they can require some specialist knowledge TripConnect tells a property what they want to know booking revenue vs. advertising costs. 5.Content rich : A TripAdvisor TripConnect advert is on the property’s TripAdvisor page, content and context rich. The battle for Pay Per Click advertising revenue from accommodation owners is going to get more interesting with the launch of TripConnect. The freetobook Internet Booking Engine (IBE) is a premium partner of TripConnect so all our customers will be able to participate in TripConnect right from the start. Our guess is that Google Hotel Finder will be watching TripConnect with their data microscope, after all not even Google wants to see their click revenue start to shrink. However, the lack of connectivity to the world’s property owners, their booking engines and inferior review data are three weaknesses they would need to rectify before a realistic chase can commence on TripConnect. TripConnect is a new service, not yet live, offered by TripAdvisor (due to launch late 2013). If a property is using freetobook they will be able to advertise rates, availability and receive bookings on TripAdvisor. The main points about TripConnect. What will happen when I have a freetobook account and a business listing with TripAdvisor ? You will be able to advertise on a Pay Per Click basis with TripAdvisor using TripConnect. Pay for clicks so your advertisement with show and TripConnect will report which clicks have returned bookings. TripConnect will show you the value of the bookings and your costs so you can calculate your ROI (Return on Investment). Click costs will be determined by the TripConnect system, you will be able to login to TripConnect and see the costs, switch the advert on or off, cap the amount and the period the advert runs for. The email address of all customers that have made a booking will be added to the Review Express system, all guests that book will automatically receive an invitation to add a review to TripAdvisor. You will need to wait for the TripConnect system to go live (late 2013). If you don’t yet have a booking system this would be an ideal time to register and start using freetobook. If you don’t have a freetobook account you can register here today ! Craig and I are really forward to our first Independent Hotel Show in London on the 30th and 31st of October. 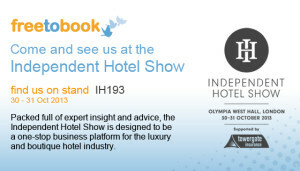 If you are going to be there please do drop by our stand (IH 193) and if you haven’t decided…. we would definitely recommend it. Some of the best names on the Independent hotel scene will be there so there be lots to look at and some fantastic opportunities to talk business face to face. Planning is underway…it’s a long trek from Glasgow, but a very worthwhile one. See you there! 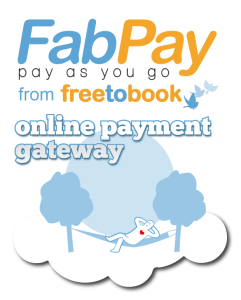 Freetobook will shortly be launching FabPay, their new payment system. For the first time ever, accommodation providers in the UK and Ireland can enjoy a Pay As You Go card handling system. This flexible and fully integrated payment gateway will be available without nasty monthly fees, whilst enabling secure card transactions for less than the cost of a second-class stamp. Using SagePay’s PCI level 1 secure vault for all transactions means you’ll no longer have any PCI headaches! If you already have a card handling account you can connect it directly into freetobook via FabPay, and if you don’t yet have a card agreement we have an attractive deal through CardSave/Streamline. Card payments and/or card details can also be securely “tokenized” on the SagePay system for later payment or repeat payment. Many of us are familiar with the format xxxx xxxx xxxx 1234, so even if the word tokenization is new to us the concept probably isn’t. Using this process, there’s no need to worry about storing cards because you can securely tokenize them for later payment….another world first from freetobook. We’ve developed FabPay solely to help solve the payment collection issues faced by accommodation providers in this increasing online market place. Due to the overwhelming interest in FabPay, we advise that you register early for priority information– email fabpay@freetobook.com with your property ID and the words FabPay Priority in the subject line. Look out for further updates by blog, facebook, twitter and email. In the meantime watch our FabPay video to find out more. 10 Things you need to know about the soon to launch FabPay card payment system from freetobook.